The Palestinian Prisoners Society (PPS) has reported that Israeli soldiers abducted, on Wednesday at dawn, two Palestinians in Tubas governorate, in northeastern West Bank, two in Jenin, in northern West Bank, and one in Hebron, in the southern part. The Jenin office of the PPS said the soldiers invaded and violently searched many homes in Jenin refugee camp, and abducted two young men, identified as Razeen Bilal ad-Damj and Mohammad Khalil ‘Ersan. It added that many Palestinians protested the invasion, and hurled stones at the soldiers who fired flares, gas bombs and concussion grenades. Furthermore, the soldiers searched a few homes, and abducted Rashid Ziad Daraghma, from Tubas city, in northeastern West Bank, and Maisara Thiab Bisharat, from Tammoun town, south of Tubas. It is worth mentioning that, on Tuesday at night, several Palestinians suffered the effects of teargas inhalation, and a few others suffered fractures, cuts and bruises, during protests that took place after the soldiers invaded Tammoun. In Hebron, in the southern part of the West Bank, the soldiers also searched homes in the city, in addition to Beit Ummar town, north of Hebron, and Beit Awwa town, west of the city. During the home invasions, the soldiers abducted Tareq Sayyed Ahmad, from al-Hawouz area in Hebron, and searched the home of Bilal Salim Salhab. 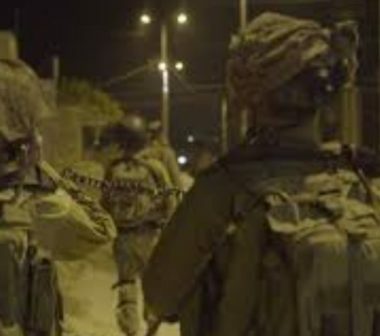 In Bethlehem, dozens of soldiers invaded the Deheishe refugee camp, south of the city, and conducted very violent searches of homes, before abducting two Palestinians and wounding two others, including one who suffered a serious wounds. It is worth mentioning that the soldiers abducted at least twenty Palestinians, in addition to summoning two others for interrogation, after invading and ransacking their homes and several buildings in the al-‘Isawiya town in occupied Jerusalem, and summoned two others for interrogation. In related news, Israeli colonialist settlers invaded Palestinian farmlands in ‘Asira al-Qibliya town, south of the northern West Bank city of Nablus, and uprooted them, while the soldiers cut 200 cactus seedlings in the Jordan Valley.